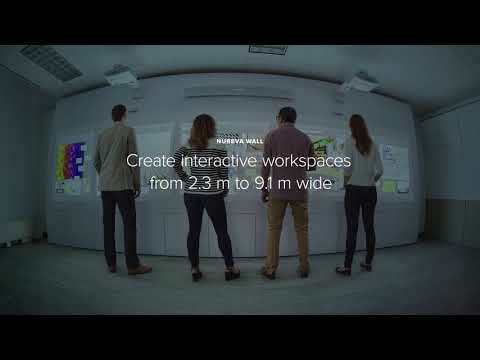 Discover how Nureva's large-format interactive wall can create both the physical and virtual space you need to get more from your team processes. Now you can visualise every idea, see all of your information clearly and map every process with this insightful new interactive wall solution. Typical processes we see in businesses all over the world involve teams sticking post-it notes and paper on the wall to create a visual process that, whilst immersive, is very limited. From designers and architects to management consultants and software developers, when visual data is key, this has become a tried and tested method of teams' collaborating and sharing ideas. The Nureva Wall makes it easy for teams to collaborate on a scale that nurtures deeper engagement with content and with each other. Combine with the Span Workspace Software and it takes the paper tools businesses are used to - sticky notes, pencil sketches, flip charts - and transforms them into flexible digital versions to enhance the creative process. The expansive virtual canvas of Nureva Wall can be used to share ideas and everyone can create, edit and organise their contributions in real time - whether they're in the room or at any location around the world. Transform any office space with an interactive wall that gives groups unprecedented room to work together more efficiently and effectively. Highly collaborative teams need space - to plan every step, align every individual and obtain every insight. Nureva's Wall system can help you achieve precisely that. Everyone can see all information at a glance on the expansive, capacitive touch surface. Nureva Wall systems are optimised for Span™ Workspace Software but can be used with any Windows® application. Choose a solution that is the right size to shape your future collaboration needs. Businesses need flexibility when equipping their collaborative workspaces and Nureva Wall configurations can be as small as 7' 6" (2.30m) wide or as large as 30' (9.14m) wide. They can span the length of the wall or be placed in a corner. You simply start with an HD ultra-short-throw projector and then add your selected projected capacitive touch surface. There are multiple configuration options so you can get the right fit for your business. The WM408i is a next-generation interactive wall that combines a high-definition ultra-short-throw projector with a projected capacitive multi-touch surface to create an expansive interactive working space that supports a wide range of collaborative processes and activities. The tightly integrated system delivers an advanced multi-touch experience in virtually any space, regardless of the wall type or lighting. The new solution also incorporates an automated start-up experience trough presence detection. Walls from 7' 6" (2.29m) to 30' (9.14m) wide can be installed in side-by-side or corner configurations to create workspaces tailored to your individual needs. The Nureva Wall is optimised for use with Span™ Workspace Software, but can also be used with any Windows® OS application. The solution simply requires a computer running Windows 8.1 or higher. Up to four Walls can be combined to create a 30' (9.14m) wide working space, with the most common configurations being two (15' or 4.57m) or three (22.5' or 6.86m) systems. Multiple walls can be installed side-by-side or in a corner. Designed to provide businesses with more visual working space, the WM408i system addresses the growing demand for digital tools that directly support and accelerate structured processes such as agile, lean and design thinking. Collaborative processes often involve distributed teams that face the challenge of working together effectively in real time for multiple locations. 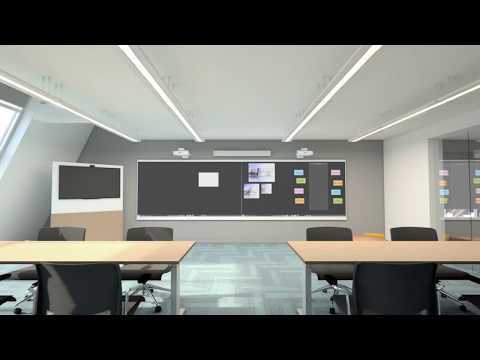 The Nureva Wall with Span Workspace Software is ideal for distributed teamwork. It is further enhanced when paired with the Nureva HDL300 audio conferencing system, which uses Microphone Mist™ technology to deliver a clear and natural audio experience.